We do not have any "Content" deployment people at my office so I depend mostly on RSS feeds to keep the sites updated and changing on a constant basis. One day, our IT department put in a Proxy Server, which killed all of the RSS feeds to SharePoint. I had to update the config file so that the RSS feeds were available once again. You will need to put the Proxy Setting into each Virtual Directory for every site that you want to be able to access the Internet. The company that I work for travels people all over the word every week of the year. I thought that it would be nice to see what the weather will be so they can be better prepared for their job. 1) Create a Custom List within your SharePoint site, with columns Venue Name, Address, City, State, Zip, and Country. 2) Open up the site in SharePoint Designer. 3) Add a DataView Web Part to bring the Venue Address to the Web Site. You can change the "21076" to your own default zip code. The "add/modify paramiters" should have automatically filled in. 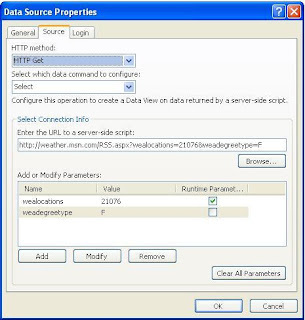 7) Drag the Data Source where you want it displayed on your web site.